QUEST Magazine for 2019 is currently under development. To get a feel for the significance and value of QUEST Magazine, see the information below from the 2018 conference. 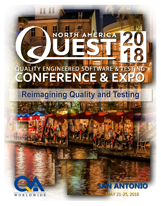 QUEST Magazine is a convenient source of information about the QUEST 2018 Conference and EXPO. Besides containing a description of all tutorials, keynotes, sessions, workshops, courses, and networking events, it also contains informative articles of interest to testing professionals. What can we learn about Process Architecture from Justin Bieber? Download the PDF version to read these articles and learn more about QUEST! Conference attendees will receive a printed copy of QUEST Magazine as a guide to the conference when they arrive on-site. QUEST Magazine is a convenient source of information about the QUEST Conference and EXPO. Besides containing a description of all tutorials, keynotes, sessions, workshops, courses, and networking events, it also contains informative articles of interest to testing professionals. Your QUEST Experience begins in May.